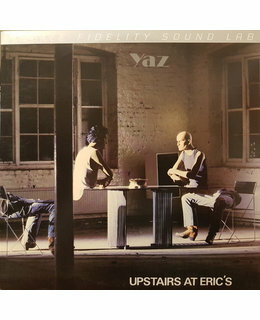 2012 US Musical Fidelity reissue on 180g LP= from Vince Clarke & Alison Moyet, including the singles, " Don't Go" and " Only You." 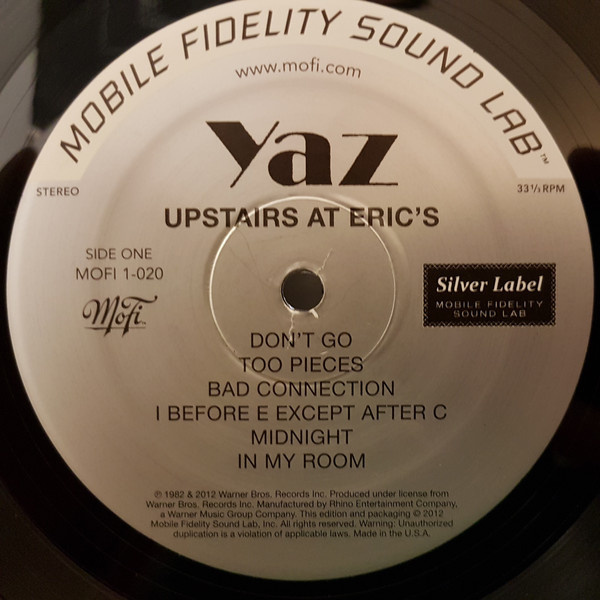 Vince Clarke can claim involvement in two stunning debuts in only two years: Depeche Mode's Speak and Spell and Yaz's Upstairs at Eric's. While Speak and Spell is, by far, the more consistent record, Upstairs at Eric's is wholly more satisfying, beating the Depeche record on substance and ambition, and is light years ahead in emotion. "Don't Go" and "Situation" are absolutely killer with Clarke's bubbling synth and singer Alison Moyet's bluesy and powerful delivery. They're both rightful dance floor staples, and have since undergone numerous remixes, both official and bootleg. "Bring Your Love Down (Didn't I)" is just as good a thumper, adding a wonderful mumbled bridge that shows how much Clarke enjoyed messing with pop music. 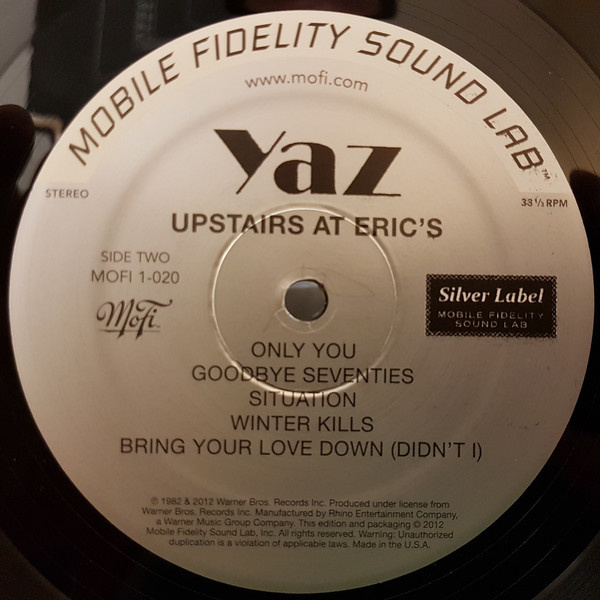 The softer "Only You" would have sounded silly and robotic if it had appeared on Speak and Spell, but Moyet's vocals makes it bittersweet and engaging. 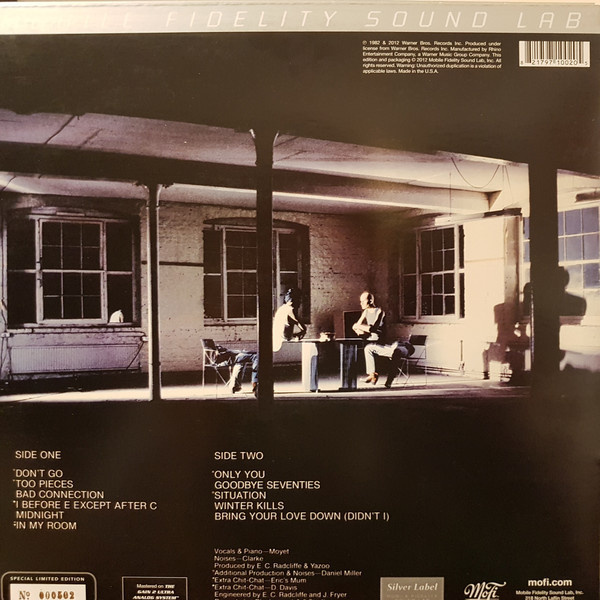 The clumsier experimental tracks make most people head for the hits collection, but to do so would be to miss the album's great twist. The loony tape loop of "I Before E Except After C," the skeletal "Winter Kills," and a disruptive phone call in the middle of the naïve "Bad Connection" offer up more complex and intimate moments. 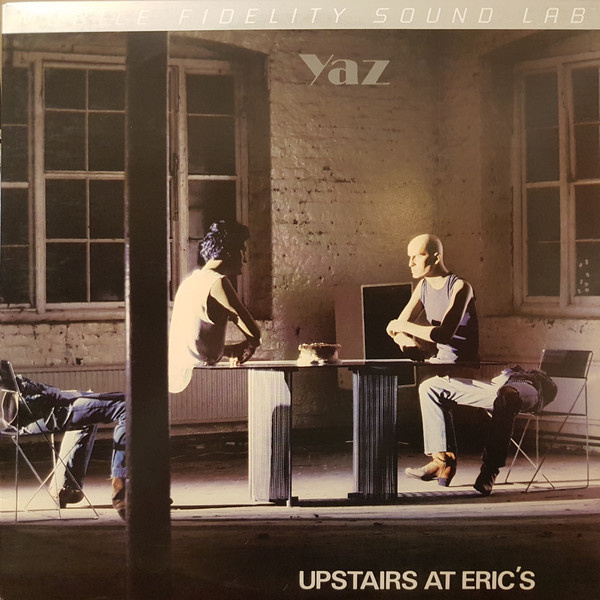 Like its curious cover, Upstairs at Eric's presents a fractured, well-lit, and paranoid urban landscape.